CUMBRIA’S fell top sheep cannot be valued simply in hard cash. Farmers believe they would be almost impossible to replace because of special qualities honed over hundreds of years. And also because they keep the Lake District a poets’ – and holidaymaker’s – idea of a rural idyll. they have been bred for hundreds of years to be “territorial”. It’s what farmers call “heafed” to the fell. This means they can be safely left on unfenced terrain and will not wander off their traditional patch. Ewes teach this behaviour to their lambs. they have special resistance to diseases, and parasites like ticks – a characteristic taken advantage of by other sectors of the sheep farming industry to breed into their own sheep. they are bred to be tough enough to withstand appalling weather, allowing the felltops to be farmed at all. they are in balance with the environment, grazing heather and grass evenly, and keeping bracken and scrub under control. This keeps the world-famous “Lake District look” to the scenery. 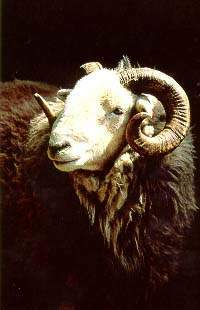 they comprise breeds like the native Herdwick, the Swaledale and some cross breeds. Keith Twentyman, Cumbria NFU group secretary, said: “I don’t think anyone knows for sure how many are up there, but it would be hundreds of thousands, belonging to hundreds of farms throughout the whole county. “These are heafed flocks that are seen once a year when they are brought down to lamb. “There has been generations of breeding over hundreds of years to make them ‘territorial.’ The mothers train their lambs to stay on their patch. For that reason they are irreplaceable. “The heafting behaviour probably comes from a time when the shepherds went up into the fells and stayed with the sheep. He said the loss of these sheep would also have an environmental impact because ‘fresh’ non-heafed sheep would wander at will, grazing all the new grass first and then all the heather. “It is in-bred into these sheep to stay on their own patch and that means the area is evenly grazed. He said: “If foot and mouth got into these sheep it would go through the whole lot. You can’t segregate them. “Sheep on the edges of territories will come into contact. It would be very, very difficult to organise a cull. It’s basically one big field. The farms can be a couple of thousand acres each. “These sheep are not always easy to gather. In fact I’m not sure it would be possible to gather them and slaughter them. Will Cockbain, hill sheep farmer with 1100 breeding ewes at Keswick, said: “It would be almost impossible to gather every sheep from an open fell situation. “Large parts of the Lake District are a World Heritage Site with many Sites of Special Scientific Interest. “They require managed grazing. 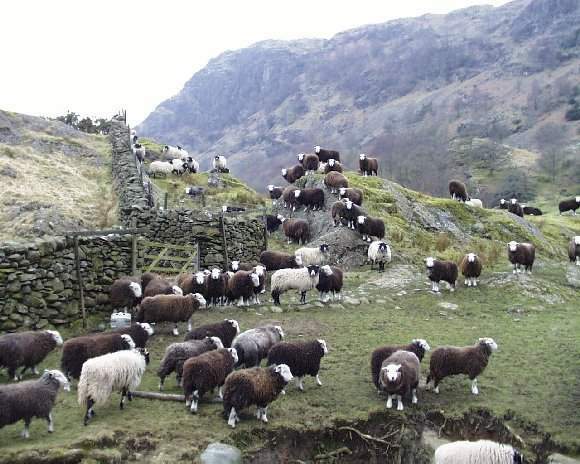 If the sheep were lost it would be irreplaceably – you can’t purchase sheep to put back on the fells. It would take an awful long time to ‘teach’ new sheep to be heafed you have to go home sometime, and they would then just wander off. “The whole system and culture that it produces, with the add on effect of a £600million tourist industry would be in danger – the agriculture would be lost and the tourist industry damaged. The article above by Kath Smart is reproduced, with permission, from the ‘News and Star’, Saturday 24th March 2001. See the News and Star website for up-to-date news stories as they happen. Beatrix Potter holidayed in the Lake District as a child, and fell in love with the area. She eventually moved to the Lake District, buying property from the proceeds of her little books, many of which were based on scenes in the Lake District. In 1923 she bought Troutbeck Park Farm, and became an expert in breeding Herdwick sheep, winning many prizes at country shows with them. Beatrix continued to buy property, and in 1930 bought the Monk Coniston Estate – 4000 acres from Little Langdale to Coniston – which contained Tarn Hows, now Lakeland’s most popular piece of landscape. When she died on 22 December 1943, Beatrix Potter left fourteen farms and 4000 acres of land to the National Trust, together with her flocks of Herdwick sheep. She stipulated in her will that the farms she left to the Trust should be let at a moderate rent, and that the landlord’s flocks of sheep on the fell farms should be pure Herdwick in breed. Beatrix was the first woman to be elected president-designate of the Herdwick Sheep Breeders’ Association, which continues to flourish.